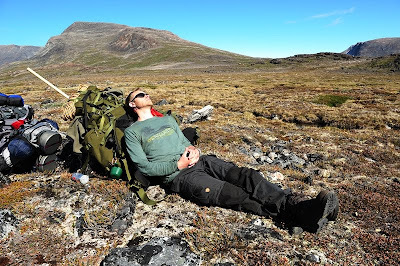 At 10 am, tents were down, bags packed and we continued on the trail. About 2,3 kilometers after the tent site we passed around a lake. 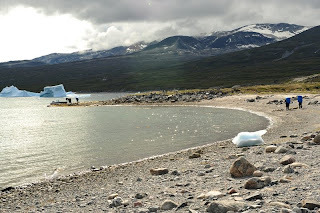 As the lake feeds the great river Kuussuaq on its left bank, we walked on the right side of the lake. Great boulders along the right bank makes this part a tiny bit difficult. We walk in the zone between lake and land, almost jumping from rock to rock. 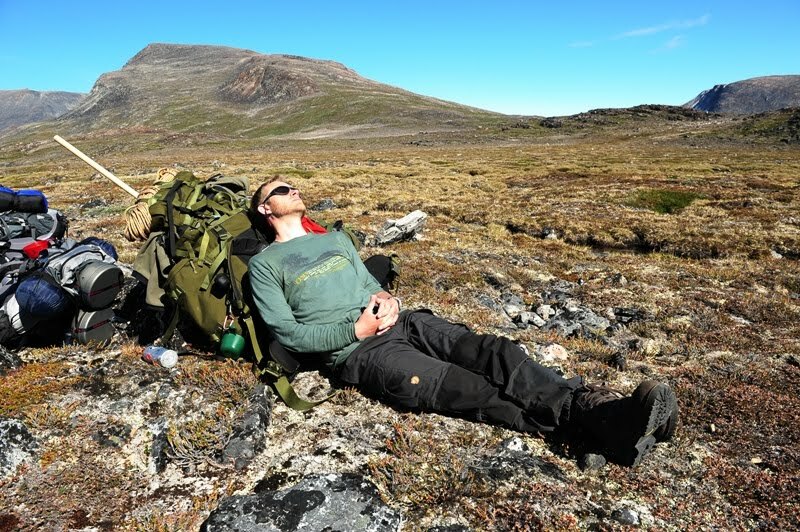 After three hours hike, a tiny rest is needed. 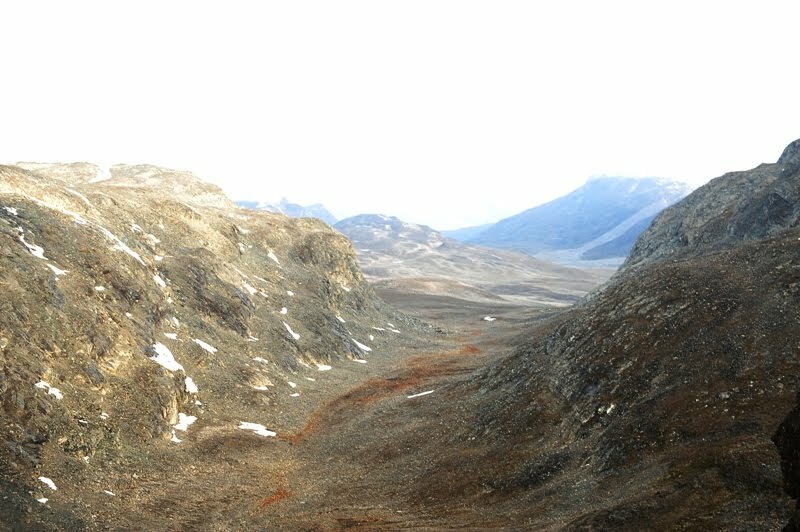 From the lake we turn right, over a small pass, then a bit downwards, and before long we see and follow a reindeer trail. Makes the hike easy. 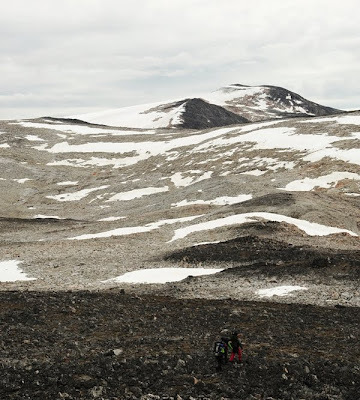 From time to time the terrain changes, and large areas of rocks appears. Easier to just cross them, than to walk around them. After 9,7 kilometers of relatively easy hiking we pitch tent in 446 meters, just below the Majoriorssutsiup Qaqa massive, an impressive mountain of some 1100 meters. At dinner time a rock slide made thunder in the valley. Huge rocks fell down from 800 or so meters down the slope. The rock slide set os minor avalanches in what snow was left on the mountain. Impressive forces of nature. We left the second campsite at around 9.30 am. From the site we pass the next two minor lakes to the right. 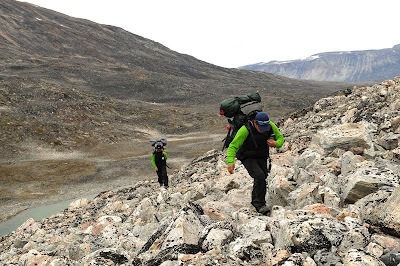 There is a relatively easy rise up along a an old moraine, up another 50 meters. From there on we had to climb a huge area of large boulders. From camp 2 the climb up the moraine and boulders took us up another 240 meters. 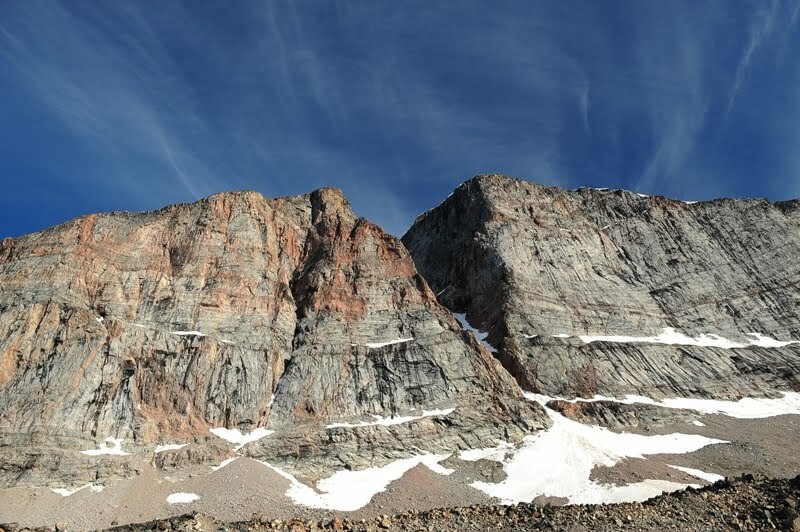 At the top of the pass there is a small red hut, and 3 kilometers from campsite 2. We took a brief break, and then continued - this time down, we were heading towards the 3rd campsite from our 2008 - hike. Around the hut a there is lot of old rubbish. It's waste from winters, when hunters use the hut as a resting place, on their dogsledge route between Qeqertaq and Ikerasak, across the Nuussuaq Peninsula. It's a sad view. From the hut we descend slowly down towards a still ice-covered lake, and pass it on the left. We make camp at 522 meters, close to a glacier. During the evening and night rain fell and fog rose up through the valley. Another rock slide was heard. We slept well, a bit nice to listen the falling drops of water. Heavy fog and rain had put a serious break to now daily starts. Around noon, however, there was a minor lift in the fog, and we decided to give it a shot. Tents bagpacks were packed and we descended further down, trying to find a suitaband le place to cross the first river. After 17 hours of rain, the river was more massive than yesterday, and it proved diffecult to find such a place. At 233 meters, we crossed it - very cold. The stream was too powerfull for the children to cross without aid, so we used a a bit of rope. From the river we turned west, and up again. However, during the hour it took the six of us to cross the river, boots of and on again, the fog had come back. Big swells rolled up from Boyes' Lake. We could just make our way up. On our way up we passed several splendid campsites - in fine weather that is. 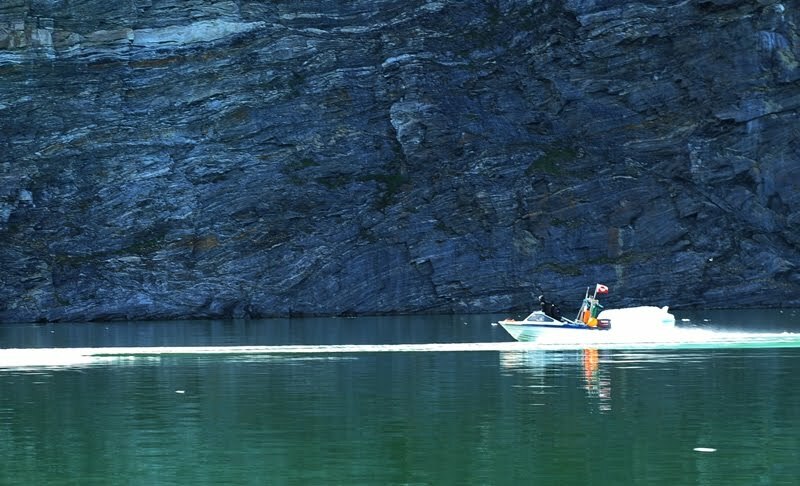 Perfect flat, no rocks and little streams of fresh water close by. We continued up through the fog, up until 515 meters, then we decided to pitch tent - navigation in the mountains became more and more impossible. But, we knew where we'd head tomorrow morning, fog permitting. Before we crept into our sleeping bags, we had a feast of dinner in of the tents, while the fog descended ever more close. After the last 1½ day in fog and rain it was with antipation that we woke up and opened the tent. Fog was still here and we discussed what to do. We couldn't wait here. Food was a problem. We only had enough food for 14 days, probably 15 or 16 if we rationed what we have. However, we needed to press on. 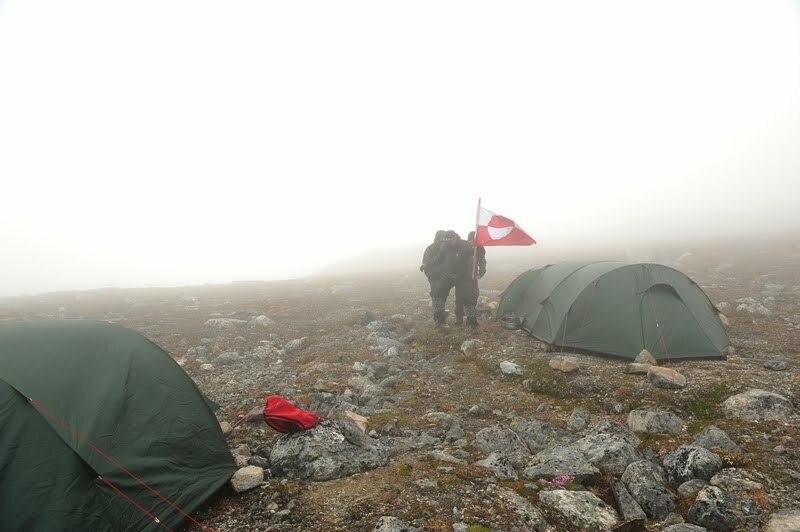 To stay in the tent, to wait out for the fog to lift. To save a bit of food we ate blueberry soup and instant rice for a late breakfast, leftovers from the last 2 days. After 'brunch' René hiked up in the fog, to do a bit of reconaissance. At a quarter to two, pm the fog had liftet enough for us to continue - with caution - upwards. We approached 600 meters and though the fog seemingly was lifting, it was only for the first some 20 minutes. Up here the it was closing in fast, and navigation was more and more impossible. The ground gave way, - heavy mud. Though we went through a bit of struggle, we pressed on for another hour. 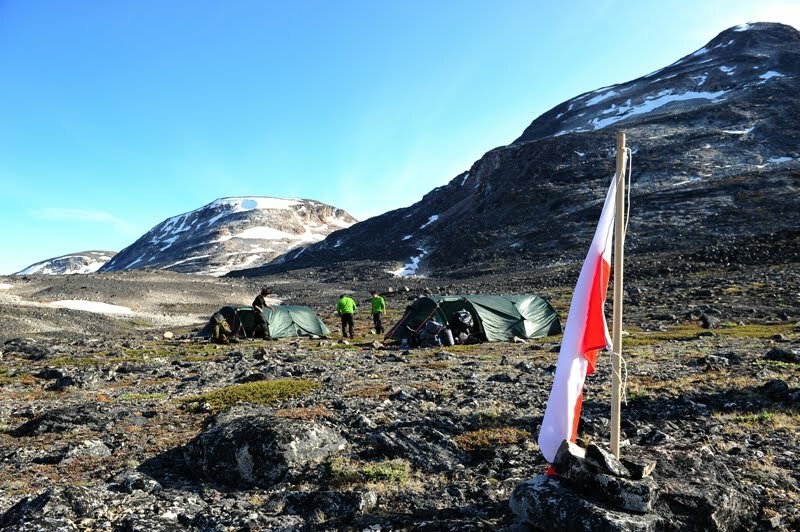 In about650 meters we pitched tent again. Only 60 meters from what seemed a drop of about 20 meters. It was too risky to continue. We had only covered a distance of 4 kilometers. Wet from fog, and a bit tired from the hike, we ate and went to sleep in our sleeping bags. When we last night reached what seemed a drop of perhaps 10 or 20 meters, we pitched tent. We couldn't see any further. The fog kept coming in closer and closer while we prepared dinner. René called out at 6.10 am, that the fog had cleared. We were not 10 or 20 meters above the valley floor as we thought last night in the fog. The now near clear skies revealed a 250 - 300 meter drop down in to the valley where we'd suppose to be at the end of the day. Tents were put down and rugsacks were packed. We tried to find a way down in the valley from the tent site. However, though René and I continued along the ridge, for 1 kilometer, further up to 820 meters, we weren't able to find any suitable passage down. We had to look for alternatives. 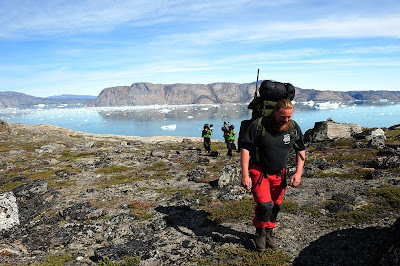 We decided to hike down where we had come the day before, a route now clear and we should be able to hike down to camp 4, and further down around a 100 meters and then head almost straight south, back on our old 2008 route across the peninsula. (a website for the 2008 hike will be published in a couple of months.) We would be heading for the beginning of the valley towards Qeqertaq. 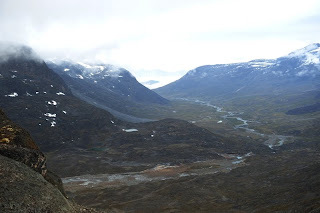 A valley we at that time 'named' Rohan. The hike down was so much easier now the fog had lifted. 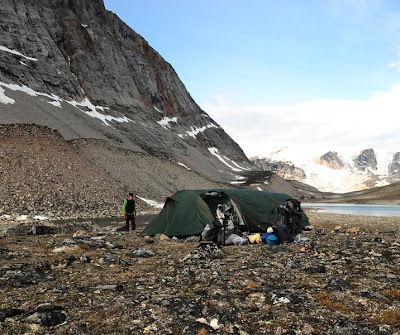 We passed camp 4 after only a good 1½ hour of hiking, a short rest to admire Boyes Lake. After crossing a small stream, we soon found an easy path south, an animal track, which runs on the western bank of a valley. 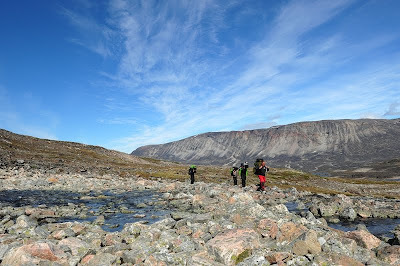 Several times the track 'disappeared', we had to walk on large boulders to find the track again later. Everything was wet from the last three days rain and fog, and walking on rocks was done with care. Only 5 hours after we woke up, we had climbed down from camp 5 at around 700 meters, we were now at some 400 meters, the beginning of Rohan was not even a kilometer away, and in a few hundred meters we were to turn west, up the valley we had looked down at just this morning. It looked to be a good day, the rain had stopped, the fog had lifted and there were patches of blue sky to the south. On a wet rock, one of the boys slipped and hurt his food. He tried to walk, but it was far from a good idea. We had to consider what to do. After the last three days of slow going, we couldn't afford to spend one or two days waiting for his foot to get better. We simply didn't have enough food with us. After two hours of waiting his foot hadn't improved, and a decision had to be made. 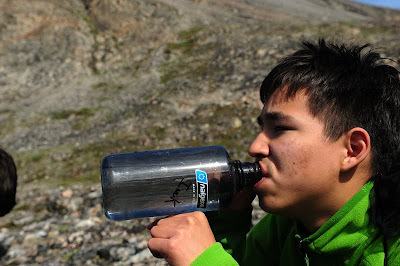 The boy could not continue the hike, and our provisions were running out - to complete the hike. We decided to head south, down the valley of 'Rohan', to the beach near the settlement Qeqertaq. 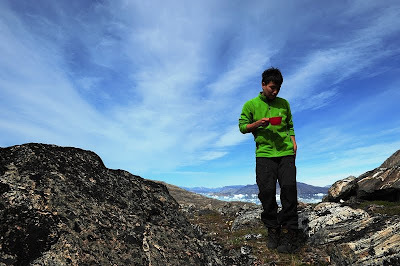 We called the childrens' home in Uummannaq, to let them know of the accident and of our decision. Most of the boy's provisions were diveded among the rest of us. Ahead of us was a 12 kilometer stretch through Lord of the Rings-like scenery. We reached the beach at the end of Rohan, after hiking 17,5 kilometers from camp 5, just after 4 pm. Via satellite telephone we telephoned the childrens' home again, and they had in the previous hours arranged for a hunter to pick us up at the beach, and sail us to Qeqertaq. This could only be done, because someone at the childrens' home knew a hunter in Qeqertaq. Therefore we advise anyone, who wants to cross the peninsula, and finish at the beach near Qeqertaq to have made arrangements prior to the trek. 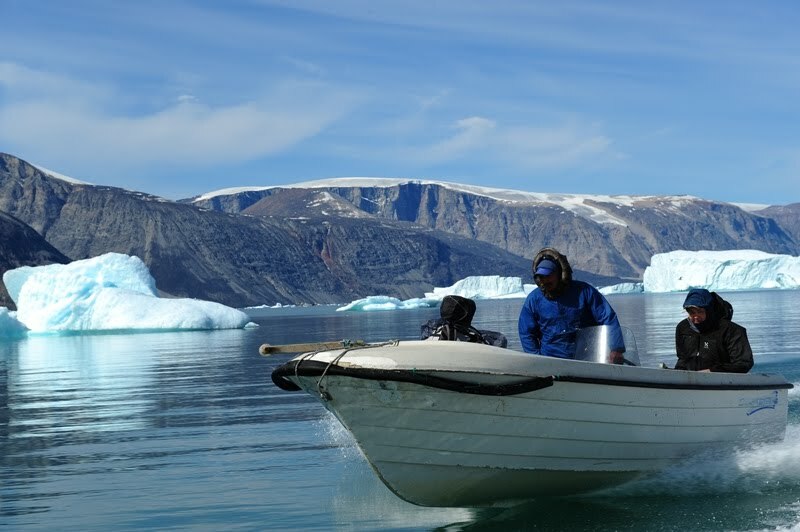 We will in the not so distant future work on establishing contact with a tour operator in Ilulissat, near Qeqertaq, to make this an easier possility. We set out with a plan to to some 230-250 kilometers on the Nuussuaq Peninsula. 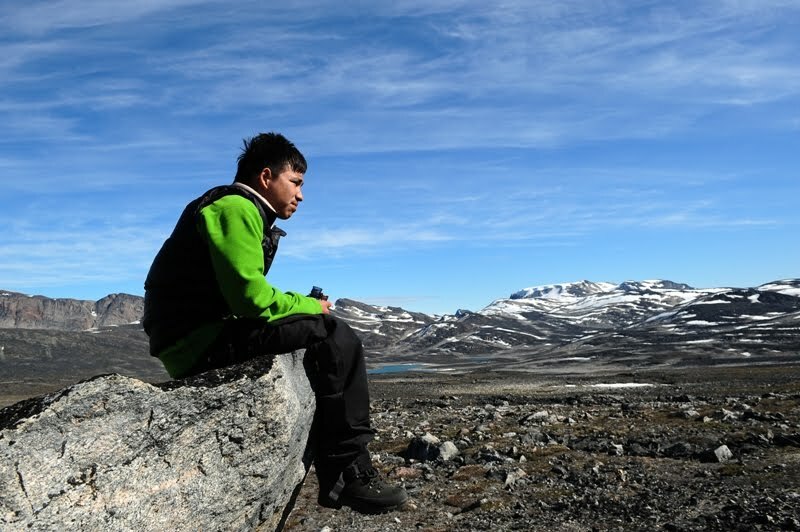 We met obstacles after only 3 kilometers, where one of the boys had to stop, and return to Uummannaq due to an old injury in his legs. At the end of the 3rd day we were stopped by rain for 17 hours. On the 4th day we were only able to hike some 4 kilometers due to heavy fog, which continued throughout the 5th day. On the 6th day, the fog lifted and spirits were high to continue into the unknown - an accident due to a wet rock caused a complete diversion of our plans. However, hiking in a terrain as extreme as the Nuussuaq Peninsula will only rarely be a hike without any obstacles. 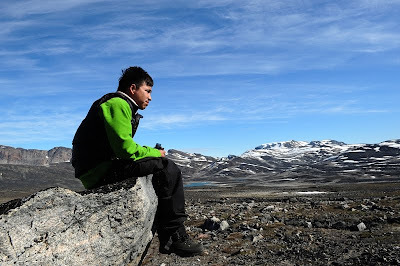 We crossed the peninsula - from north to south, some 50 kilometers in six days. 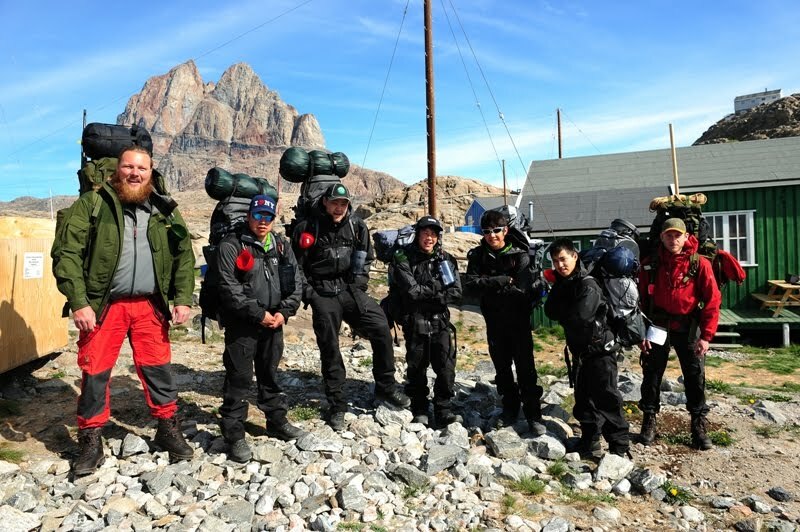 In the coming months, experiences from the 2008 trek on the peninsula will made available on a seperate website. Though we had times of poor weather, the experience and adventure was great. Though it was the first longer hike for many of the boys their high spirit throughout the hike was memorable. In the coming days, more details and photos from the hike will be added to this website. Yesterday, Thursday, we pitched tent for the first time, these anyway, two new ones from Fjallraven - two tents, each for four people. Friday was spent preparing the last details. Breakfast was bought, muesli in different varieties. 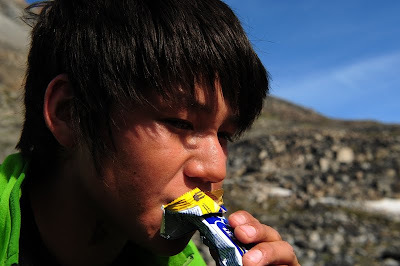 Every evening meal will consist of 4 - 5 bags of freeze dried food + aditional rice and pasta. Should be enough for the seven of us. Our new cooking equipment was also tested. This is the first time we use propane; previously we've used alcohol. However, we've chosen to the propane solution to reduce weight. Lastly, we packed everything. Each person is now solely responsible for carrying personal items such as sleeping bags, toothbrush etc. Furthermore, items that we all depend upon has been divided among us all. 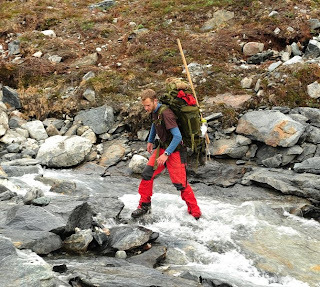 Two tents, two cooking apparatus, one rifle, one set of camera equipment, map, gps, first aid kit, 7 canisters of propane, 1,6 meter wooden pole to cross rivers, one flag, sun protection. We are set to go. 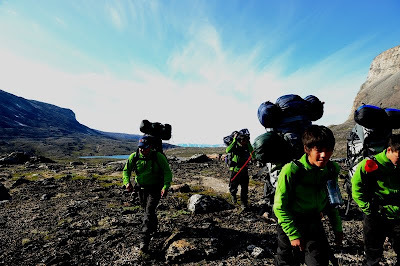 We leave for Eqaluit, some 55 kilometers east of Uummannaq tomorrow morning, 26th June, around 10 am. 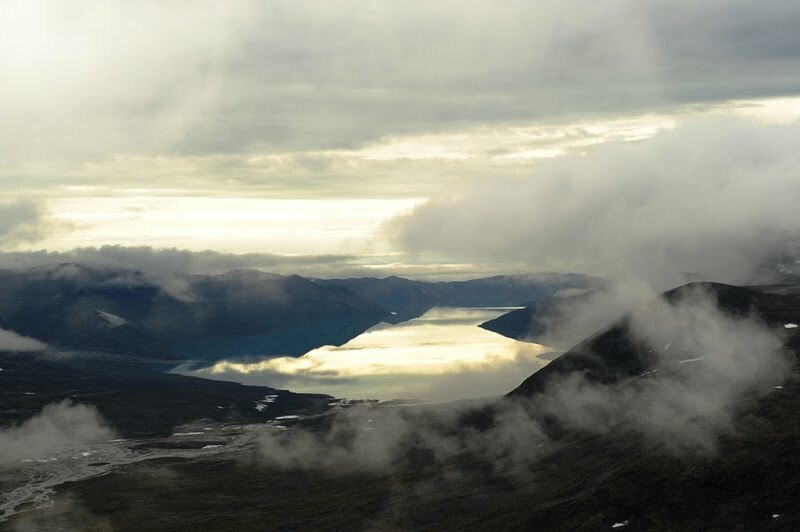 Ahead of us lies some 250 kilometers of Arctic wilderness. Can't wait. We should reach Niaqornat in about 13-14 days.